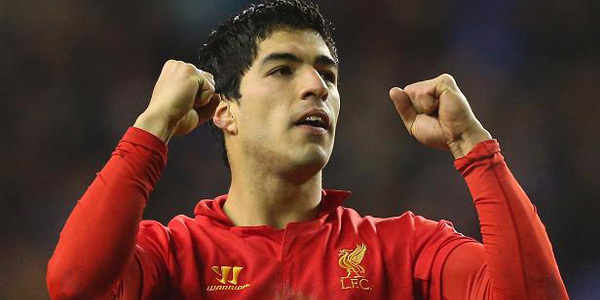 HomeFeaturedLiverpool striker Luis Suarez awarded as PFA Player of the Year …. Liverpool striker Luis Suarez awarded as PFA Player of the Year …. Suarez’s strike partner Daniel Sturridge, 24, and Liverpool captain Steven Gerrard joined him in the Premier League Team of the Year, along with three Chelsea players – goalkeeper Petr Cech, defender Gary Cahill and midfielder Hazard. His name was booed when it was read out at last year’s ceremony as he was beaten to the award by Tottenham’s Gareth Bale, just days after his ban for biting started. Liverpool boss Brendan Rodgers stuck by him during his suspension but the Uruguayan’s Anfield career appeared to be in doubt when in August he claimed that Liverpool had reneged on an agreement to let him leave if they failed to qualify for the Champions League. Arsenal had two summer bids turned down for Suarez – the second an offer of £40m plus one pound, which was an attempt to trigger a clause the Gunners believed was in the player’s contract. Championship Team of the Year: Kasper Schmeichel (Leicester), Kieran Trippier (Burnley), Aaron Cresswell (Ipswich), Wes Morgan (Leicester), Jason Shackell (Burnley), Danny Drinkwater (Leicester), Andy Reid, Craig Bryson (Derby), Will Hughes (Derby), Danny Ings (Burnley), Ross McCormack (Leeds). League One Team of the Year: Carl Ikeme (Wolves), Sam Ricketts (Wolves), Danny Batth (Wolves), Harry Maguire (Sheffield United), Jake Bidwell (Brentford), Bakary Sako (Wolves), Adam Forshaw (Brentford), Kevin McDonald (Wolves), Ben Pringle (Rotherham), Britt Assombalonga (Peterborough), Callum Wilson (Coventry). League Two Team of the Year: Tommy Lee (Chesterfield), Michael Smith (Bristol Rovers), Ian Evatt (Chesterfield), Liam Cooper (Chesterfield), Michael Rose (Rochdale), John-Joe O’Toole (Bristol Rovers), Antoni Sarcevic (Fleetwood), Gary Roberts (Chesterfield), Ian Henderson (Rochdale), Sam Winnall (Scunthorpe), Scott Hogan (Rochdale).